As I mentioned, I spent my Spring Break cleaning my dad’s house. This weeklong event included mopping, organizing, and having my Dad build a new console out of some old, junky dressers. Well, while doing all that organizing, I came across a collection of old legos, left over from mine, and my brother’s childhoods. Of course, these are perfect for Son to play with, but there was a problem. 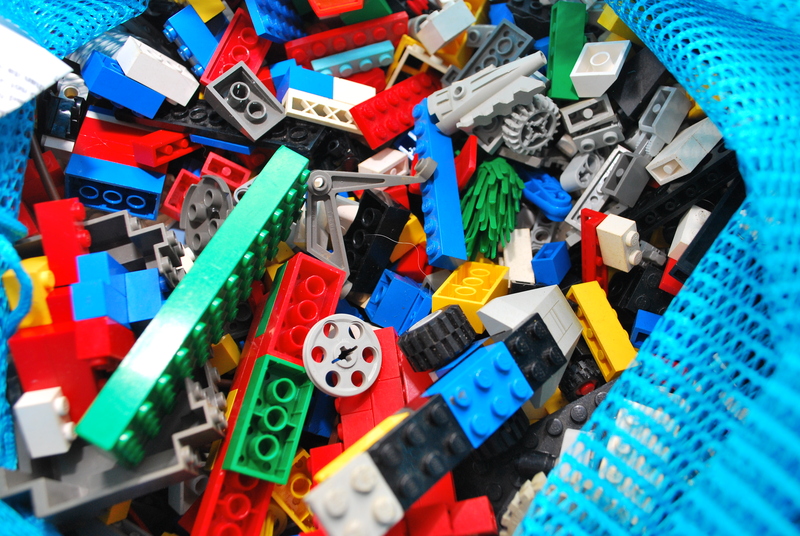 It seems that years of being in uncovered storage, along with being played with on, and cleaned up from, a dirty floor had made the legos gross. We’re talking turn your fingers icky kind of gross. Sure, Son didn’t seem to notice, but I certianly did, and even Husband, who spent the week sandblasting, among other dirty things, noticed. Something had to be done. I decided to give the washing machine a shot. I figured this could be dangerous, but I’d keep a close eye on it just to see how it did. 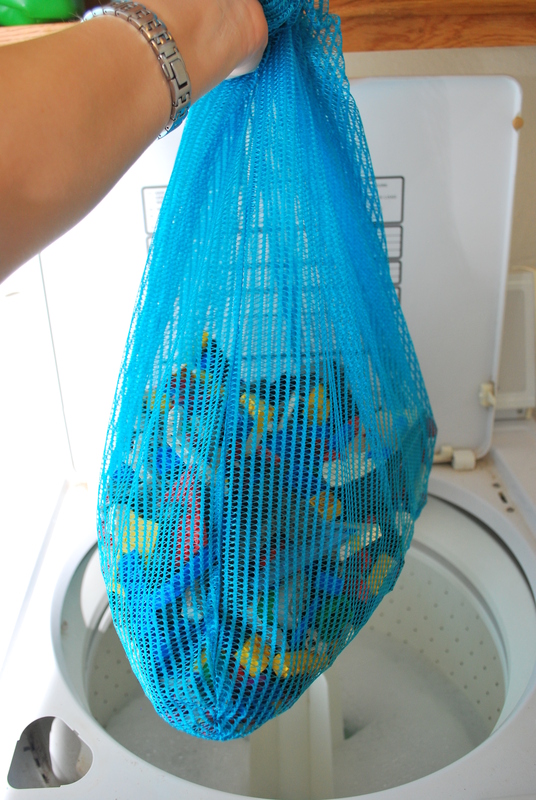 I put all the legos into a large laundry bag, gave them a good shake, and dropped them into the washer full of hot water and a bit of soap. Yes, this was noisy, and I’m sure it would’ve gone a lot smoother if I had one of those washing machine without the center spindle. Just the same, it worked! After the cycle was over, I took the legos outside to drip dry. I started by just hanging the bag, but after an afternoon of hanging out, most of the pieces were still wet. If I had had one of those mesh sweater racks, I would’ve spread them all out in a thin layer to dry, but I didn’t. Dad doesn’t wear sweaters, and even if he did, he’d never lay them flat to dry. Instead, I had to leave the legos outdoors for a few days, remembering to stir them around every now and then. I would reccomend a good quality bag, though. Legos can get sharp, and you don’t want holes letting the legos escape. 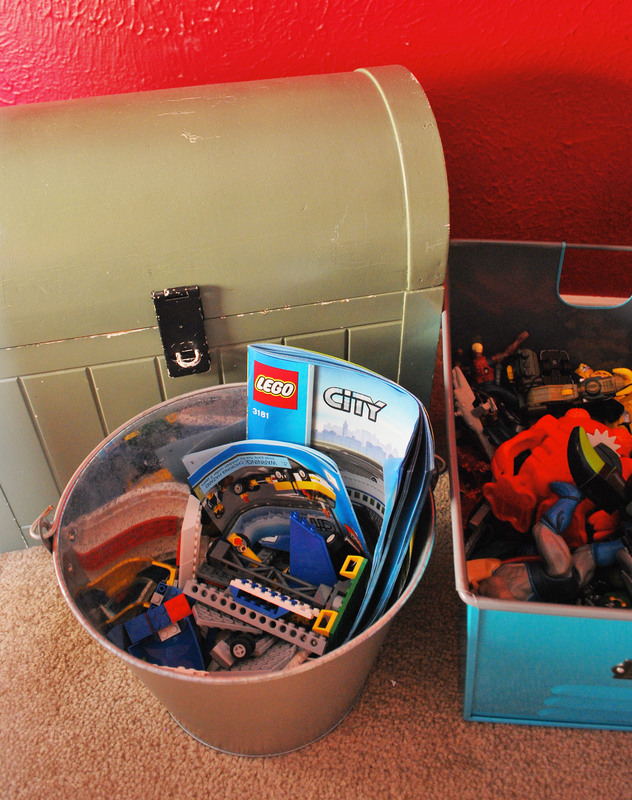 Still, the legos are now clean, and I’m not so averse to playing with them; Son will be happy to hear that. Last week was Spring Break, and Husband and I took Son for a weeklong stay at my Dad’s place. Husband had big plans to work on our 1967 Chevy Truck, which he inherited when his father passed, and since I didn’t want to dive into that mess, I decided to finally accept my Dad’s pleas to clean and organize his house. In addition to this, I took down two books, and a secret sewing project. I figured I could clean and organize Dad’s kitchen, guest bath, playroom, begin to pack up my brother’s room so it can be the grandkids’ bedroom, since he’s finally skipping the nest, and electing to stay in his college town over the summer, and then relax with my books and stitching. Plus, Husband and I scheduled a surprise zoo visit for Son. Boy did I underestimate my time. First, let me say that my father is single, and works two jobs. He is typically only home between mid-night and 6 a.m., and then has Saturdays off. That leaves just one day to get anything done, and the things he prefers to tackle are the outdoorsy sort of things, like planting a garden, digging up his septic system, or fixing a car. Add to that the fact that my brother, up until very recently, lived at the house only on weekends, along with at least 2 of his closest male friends, and other party guests. Dad’s house was more like a frat house than anything I would call home, but since it wasn’t the house I grew up in, I wasn’t really bothered by this. That is until I had to live there for a week. I started my clean sweep with the bathroom. The guest bathroom is obviously used by all guests, and to occasionally wash the dog, but most of the guests were male, and drunk, and well, if their aim is poor sober, just imagine how it is when they’ve had a few too many. And then there’s always what happens after they’ve had even more than too many. Yep, the bathroom was gross. It took me a while to muster up the courage to get my hands wet, but once I started there was no turning back. I scrubbed the fixtures, the walls, the mirror, and the floor. I washed the shower curtains — Dad has two, the rug, and the towels. Luckily, washing the curtains was a simch since I discovered I could wash them in the washing machine. Still, it took me most of the day to get it all done. 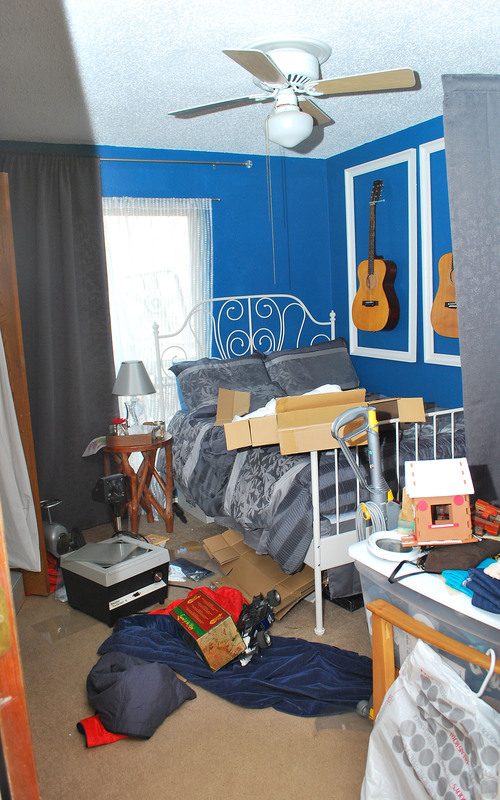 The next day, I began tackling the playroom. 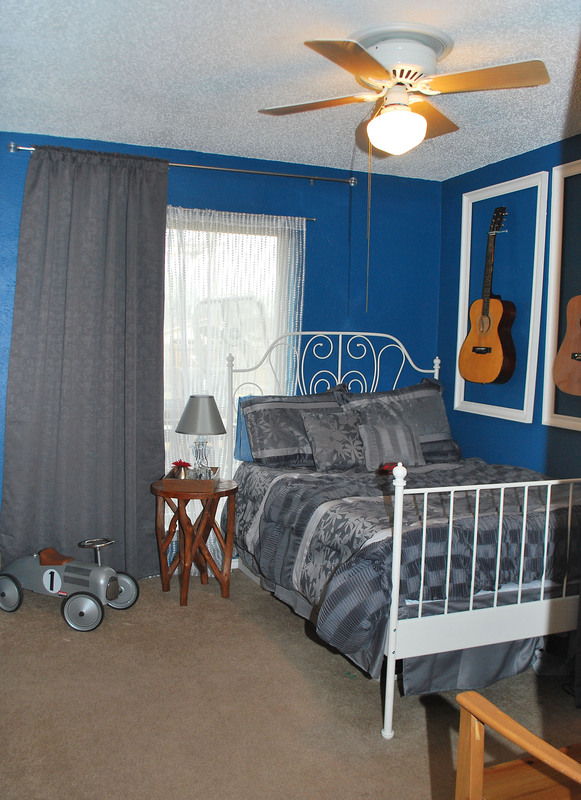 Dad’s playroom isn’t really what you imagine when you think playroom. It’s really a room with a TV, two computers on separate desks, although only one computer works, and various old board games and toys from days gone by. It needed both a good scrubbing, and some serious organizing. I figured it would take me a full day to get this room under control, but I was off by a few days. Yes, it took me days! Three days, to be exact! I started by boxing up all the VHS tapes. Some were movies that I wish I could play for Son, but we don’t have a working VCR, and others, well, I don’t think you can get anymore, like the original release of Star Wars. So if you’re wondering why I didn’t pitch them, well, they weren’t mine, for one, and they are sort of sentimental. Besides, they’re only taking up three boxes worth of space in the shop out back. More importantly, though, boxing up the tapes meant freeing up five drawers of space in these dressers Dad has in the playroom. Originally, the dressers flanked the TV in the background, but I had a better idea. I though Dad could use a console table, since he doesn’t have, and doesn’t want, a coffee table. The console would be a place for people to put drinks, and I figured with a bit of creativity, I could create more storage. Sure, the dressers are just cheapy, particle board and paper things that I think Dad was given for free, but I knew I could work with them. Besides, I didn’t really have a budget to shopping. Instead, I set them where I wanted them, and then asked Dad to cut a top and shelves out of some furniture grade plywood he happened to have on hand. 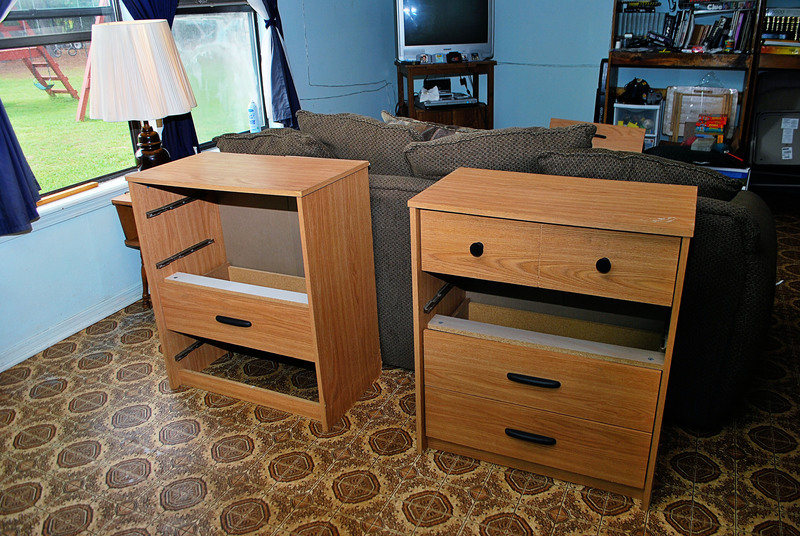 After he measured, cut, and fitted all the parts, Dad attached the pieces to the dressers with a pneumatic stapler. 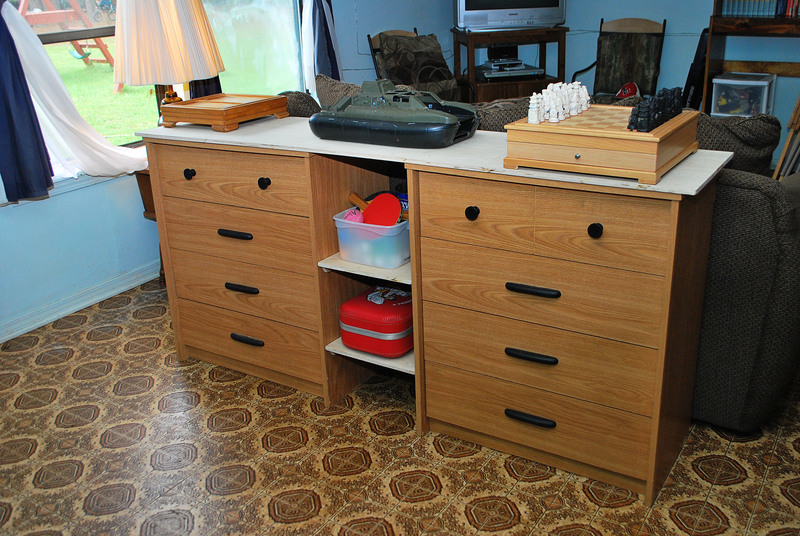 The dressers were now a console table, with added storage, and not just some throw-away furniture. Now, I know the new console could use some paint, and a bit of dressing up, but my job was to clean and organize; I’ll leave the decorating up to the owner. 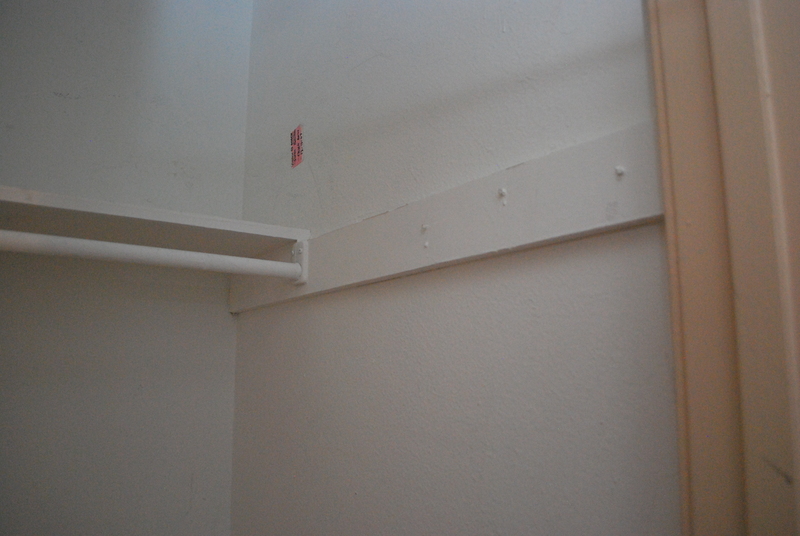 Really, I think with a coat of high gloss white, and new hardware, you’d never know it was pieced together from trash. What do you think? At the very least, I think it’s encouragement to keep your mind open. I’ll be back tomorrow with another cleaning tip. I know, it’s revitting blogging at its best. Yeah. Welcoming, right? The bed isn’t even clean off! Well, I finally got on that, and my guests should be much more comfortable, now. The room is all cleaned up, and organized. The bedding is washed, the rug vacuumed, and I even have a water pitcher with two glasses on the night stand. So after all that work, my guests have to come, right? I just hope they don’t look in the closet…. Usually, my house is kept pretty neat. Sure, it’s lived in, but I do pick it up every week, and you all know I’ve been sticking to my monthly House Keeping schedule as part of my Home Maker resolution. 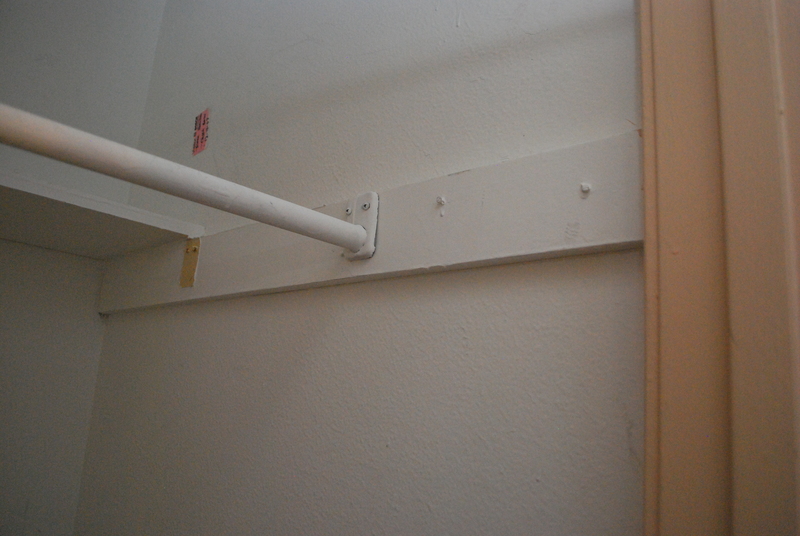 Just the same, I still have secret messes, like this one in the bathroom cabinet I fixed up over a year ago. Although, it turns out that it wasn’t such a secret mess; many guests apparently like to open the doors when using the facilities. Today, I’m happy to report that it is still clean and tidy, but I still had another secret mess. My guestroom dresser drawer. Even worse, this was taken after I started to pull stuff out. 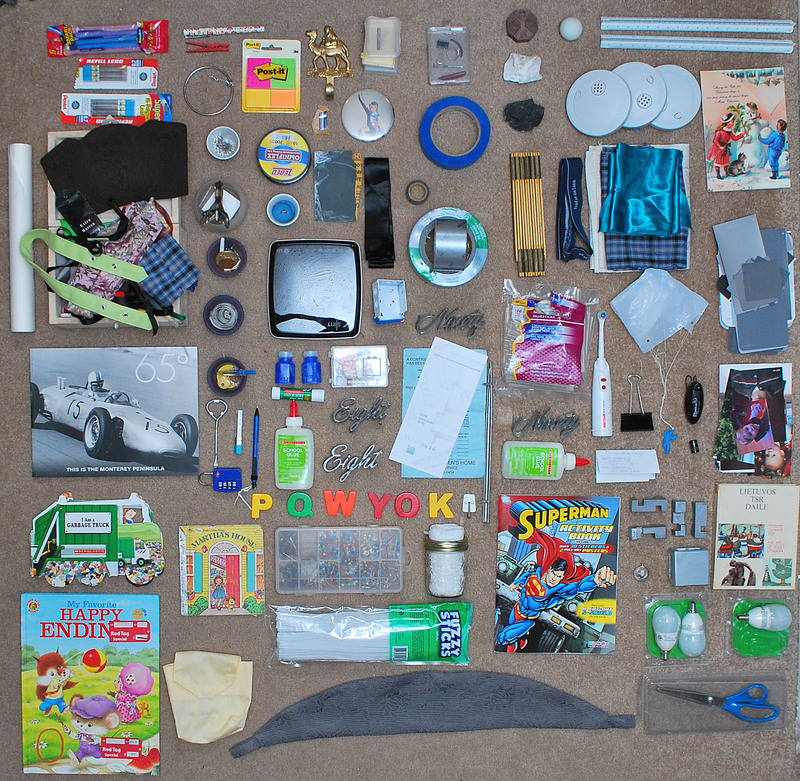 So I carefully emptied the drawer, and laid the contents out neatly so you all could really see what was there. Prepare to be amazed. From the top left, moving right, we have office supplies, a hook brought to me from Dubai, or somewhere like that, some empty plastic boxes, a picture button of me from grade school, a box with my class ring, a metal puzzle thing, two rocks from Italy, a ping pong ball, two scales, fire alarms, and a Christmas card. A roll of 12″ trace paper, my sewing box — a mess unto itself, votives filled with various small stuff, fishing line, a CD-R drive (really? ), sandpaper, ribbon, window blinds brackets, tape, my folding ruler, an elastic band, and several scraps of fabric. A brochure book from Carmel, more tape, a paint can key, lock, more office supplies, some glue, two bottles of bubbles from my mother’s wedding way back in 1998, another plastic box filled with 3M foam, metal car emblems, random papers dated 2007, a whole bag of glue sticks with a hole in it, more glue and emblems, an electric toothbrush used for cleaning things, a clip, a random note on dog breeders, Son’s toy parachute guy, strange plastic clippy thing, and a stack of mixed photos. Three books to be repaired, a cloth pouch, some wooden letters, a box full of beads and pins, a package of pipe cleaners, a jar of toilet paper, the swag from my Ikea curtain, a superman coloring book, a metal brain puzzle, book of Ukranian art, lightbulbs, my long-lost pinking sheers — I hid them from Son after he used them to cut his hair just before my MIL’s wedding! Fwew, that was a mouthful! So I finally tackled those books. I taped and glued them up, and then had Son put them back on his shelf where they belonged. I put the CD-R drive into the ‘electronics box’ with the rest of the miscellaneous electronic crap, like zip drives and extension cords. I put the fabric scraps with the rest of the fabric in my fabric box, and sorted out my sewing box. I moved all the office supplies to the desk, where they should be, and put the photos away. I tossed the odd papers, the toothbrush, the cloth pouch, and even that parachuter. After finding a solution video on youtube, and a bit of forehead scrunching, I put that awful metal puzzle back together, taped it up, and put it with the other puzzles we’ve been given over the years. I kepted the crafting / art supplies, and the light bulbs. 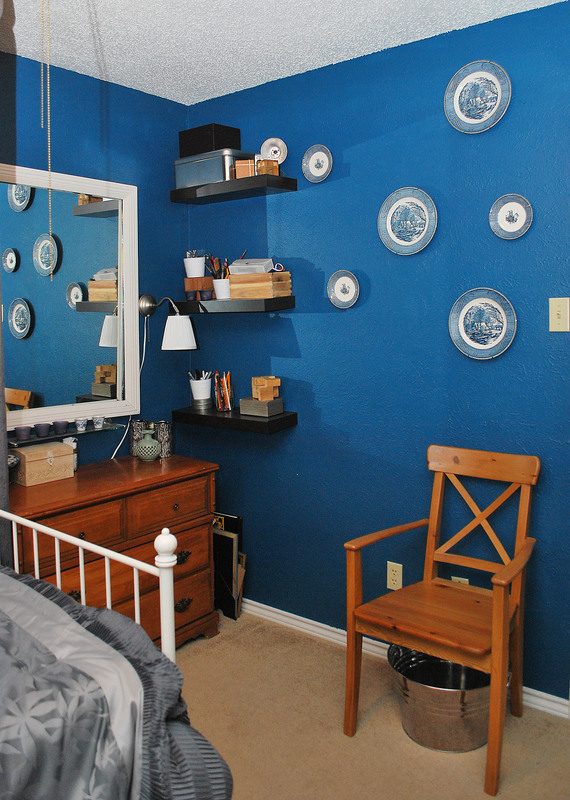 Since they are the bulbs to the lamps above the dresser, it made sense to keep them. 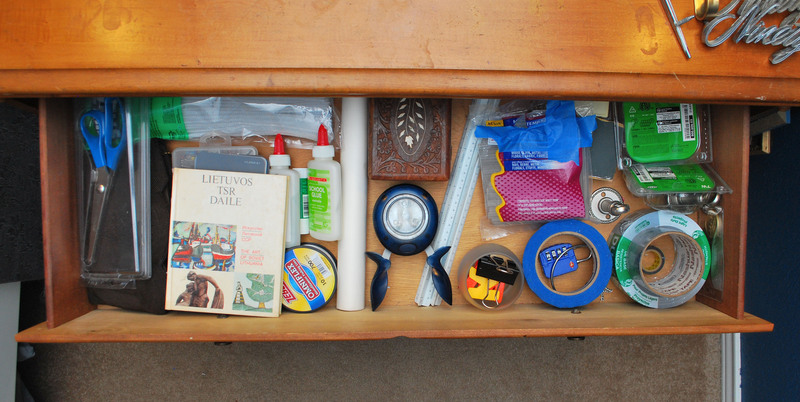 I taped up that holey, whole bag of glue sticks, tried to keep the drawer segregated to each side. A bunch of the items that I left out of the drawer, like the emblems, the superman book, and the Carmel book, and that hook from the middle east, are now on top of the dresser. They are all on my “Get on That Already” list. I want to frame the black and white photo of the race car, I want to scan in the Superman pages, and use them for a painting, and I need to find places to hang the emblems and that hook. At least the drawer is cleaned. Guess I better get on that other stuff! Have you been hiding a dirty little secret? Tell us all about it! Son is getting older. And now, his toys are getting older too. He’s graduated from teethers and stack-able boxes to super heroes and duplos. But even the duplos will go away soon. He got several lego sets for Christmas. I have yet to decide if they were a gift for him, or pay back for his parents, maybe both. Just the same, I was in need of a new place to keep all these small, sharp, and painful pieces. We received this bucket, one of a pair, actually, as a gimme from our favourite Austrian restaurant. Ever since happily carting them home, they’ve lived empty in the garage. 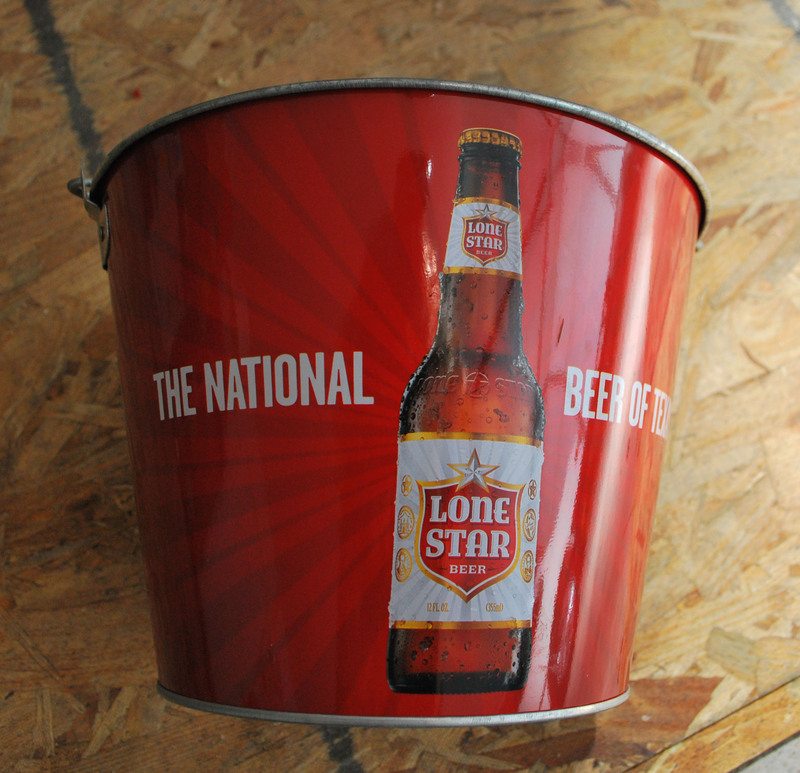 Now, sure, I could’ve left the bucket as is, but something just didn’t seem right about keeping a beer bucket in Son’s room; maybe it was the Lone Star brand. Yuck. 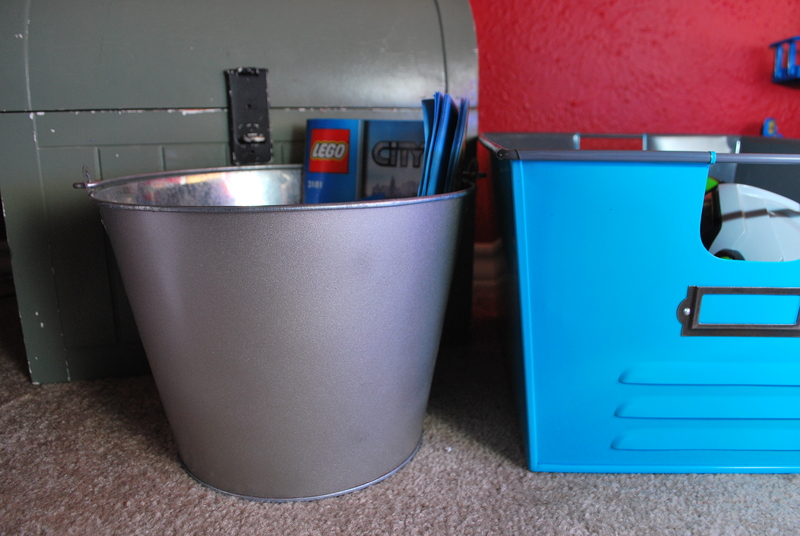 I broke out the spray paint, and shot the bucket silver. Several coats later, I had a more kid-friendly storage option. Even better, it was free, and those pesky land mines are no longer threatening my bare feet. Ok, so that’s a poor excuse for the Red Hot Chili Peppers, but once it got stuck in my head, there was nothing I could do. Besides, it pretty much sums up how happy I am to have all the Christmas stuff put away. It took me a whole day, minus the Grocery Shopping interruption, to get my house back to normal. That included taking down all those ornaments I hung around randomly, the giant snowflakes, and of course the tree and things. But with all my Christmas Spirit, this year, I didn’t have room for all my decor in the little ornament tub I usually use. Luckily, I had some things laying around to get my stuff tucked up safely. First, I had a handful of ornaments that didn’t come with packaging. 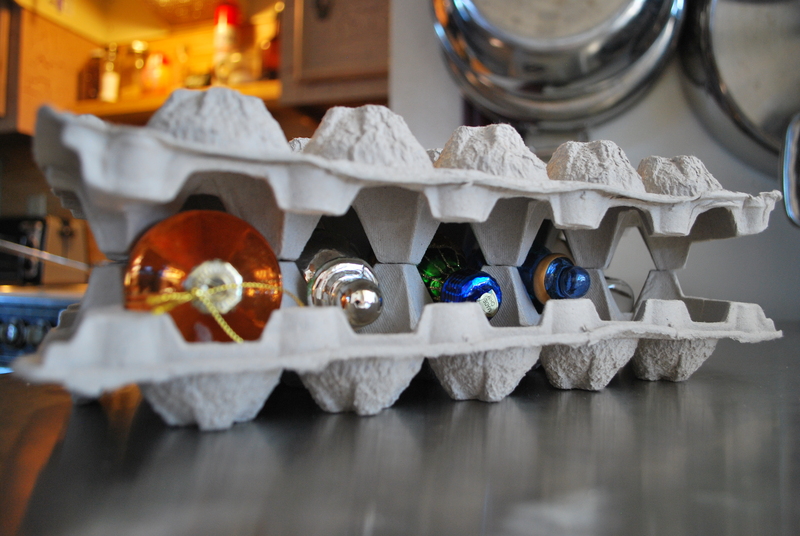 I remembered that I had about 100 large egg trays from when I was buying 2.5 dozen eggs a week — Husband was on a diet, and by 100, I really mean more like 8. I grabbed one, and tested some ornaments in the spaces. The holes were too small for any of my round ornaments, bummer, but it worked perfectly for the long, crazy shaped ones. 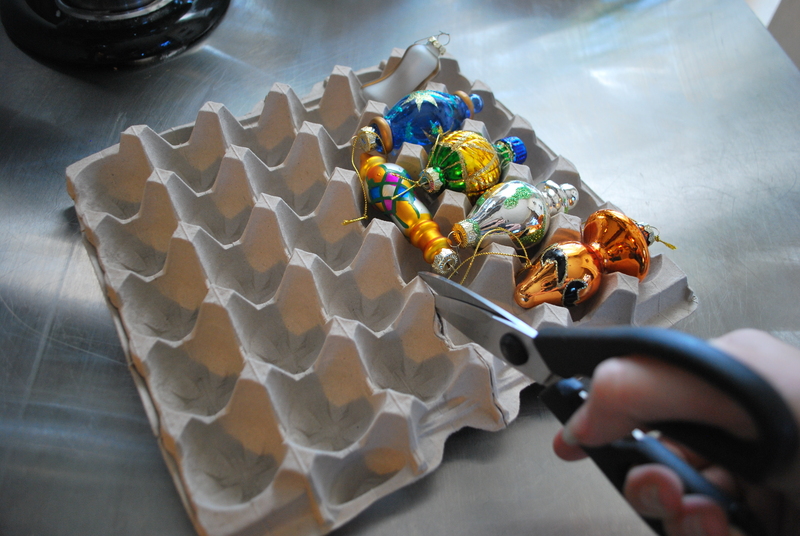 Since the tray wasn’t full, and the bulbs were a bit tall, I cut the tray in half, and sat it on top. Perfect, fit! I used some tape to seal it up, and placed it carefully into my ornament tub. I still had some overflow, though. It was clear I needed to up my box number, and I had the perfect one out in the garage; a liquor box. Liquor stores always have boxes on hand, and because they are used to hold heavy, glass bottles, they tend to be pretty durable. 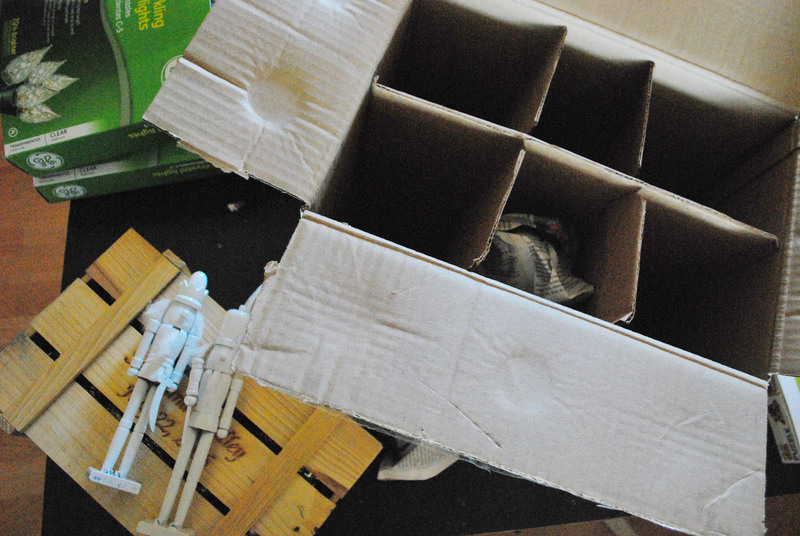 Even better, the boxes always have dividers making them perfect for Christmas decor. I wrapped, and put my tree-shaped jar in the center, wrapped and put all three nutcrackers in another section, and then carefully wrapped the remaining ornaments, like my thrifted antique ones, into other sections. I was able to get all my decor, with the exception of my pop-sickle snow flakes, into three boxes, and that includes my tree. I think that’s pretty good, and Husband should be thankful, since he’s the one that has to put it all back into the attic. 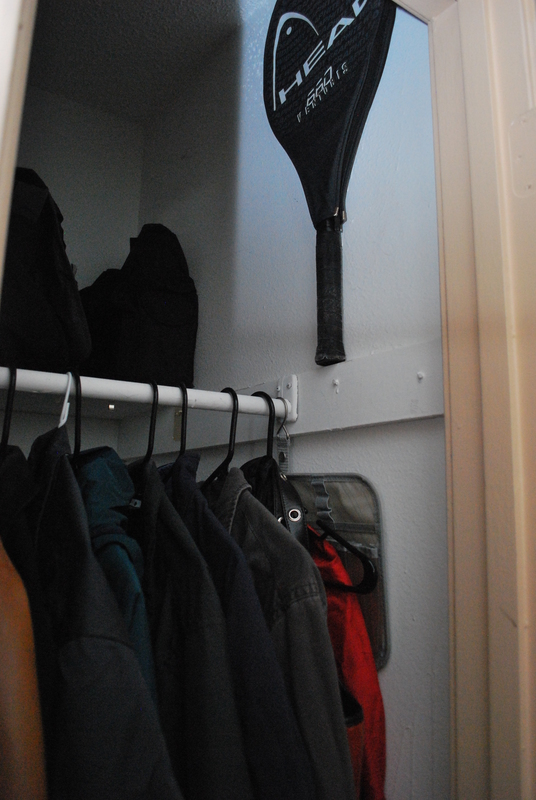 The closet rod was hung at the back, and it’s a fairly deep closet. 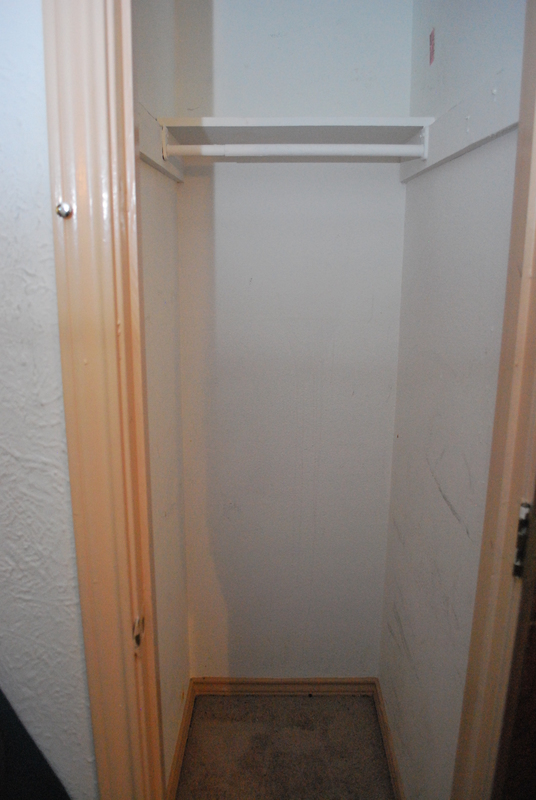 With the rod at the back, you couldn’t store suitcases, ect, in there without messing up the coats. 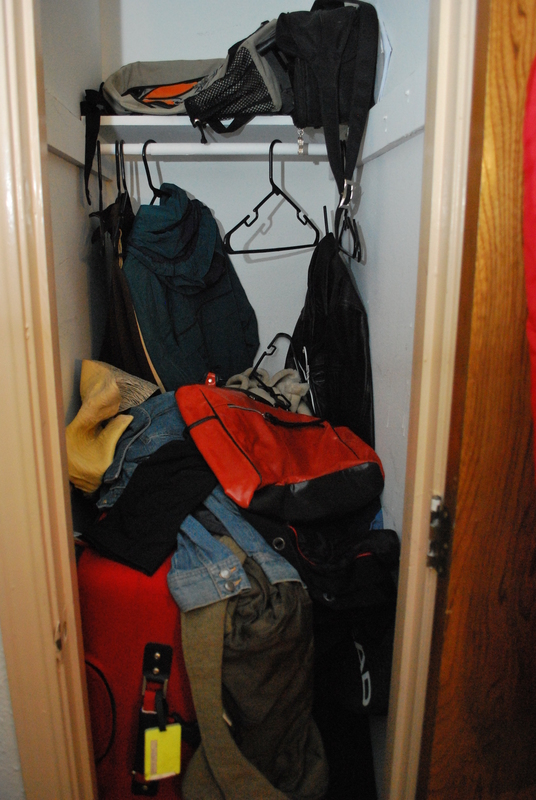 It was awful, so I cleaned out the closet…. Then went and got the drill. With a few zips, I had the rod removed, and moved to a more appropriate location near the the front. The shelf in the back is usable, the suitcases are nicely stacked in the back, behind the coats, where they won’t be in the way. It’s like a gained a whole other closet. Really. Now all that’s left to do is smack my forehead. Why didn’t I do this years ago? D’oh!